The smell of cigarettes is unpleasant to nonsmokers. If you purchase a car from a smoker, you want to remove the odor left behind from cigarettes before you drive your family on an outing. Air fresheners will not do the trick; they just mask the odor. To rid the car of the cigarette smoke smell, you need to efficiently remove the remnants of nicotine from your car. Removing nicotine residue in your car will remove the cigarette smoke odors. Mix the vinegar, warm water and baking soda together; it will fizz. Pour the mixture into a plastic spray bottle. Open at least one of the car doors for fresh air. Spray the cleaning solution onto the car's interior windows; wipe clean with paper towels. Clean the vents with a cotton swab that has been dipped in the solution. Clean the remainder of the interior with the solution, excluding any carpet, leather and fabric; wipe clean with a kitchen sponge. Apply upholstery cleaner to all areas that are cloth; allow to dry before vacuuming. Clean all carpeted areas of the car with carpet cleaner. Wipe down leather seats with a small amount of mild detergent mixed with warm water; allow to air dry. 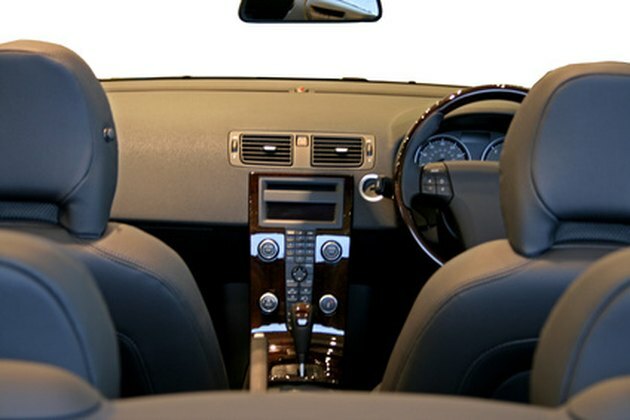 Apply a leather conditioner to the dashboard and leather or vinyl seats to make your car smell new. Kathleen Bona has been enjoying her career as a freelance writer for the past two years. Her areas of expertise include the care of animals, cooking, astrology, entertaining and green living. She also works as a ghostwriter for various websites and blogs.